This screen displays a record of past drawings with winning lotto numbers. The main lotto or keno number is always displayed first, followed by any extra or power ball numbers in parenthesis. After that, the Delta numbers are displayed inside square brackets. If you scroll the screen horizontally, you will see a colon followed by extra data, like days and dates of drawings, that can be accessed by the filter to build custom displays of the past drawings. While your history file can be as long as you wish, and can keep growing indefinitely, and can be fully analyzed, only 4999 drawings can be loaded for viewing. If you had records of, say, 10,000 drawings, normally only the most recent 4999 of them would load for display. However, if you used the filter to look for only Tuesday drawings, for example, then the entire 10,000 records would still be searched for those Tuesday drawings. To make the best use of Analysis Lotto's ability to calculate picks based on past drawings, you should maintain the database of historical data by entering each new drawing as it takes place. When you press Add Latest Number, you will be taken to the add latest numbers screen. Enter the lotto number in the box provided, and add any other information that might prove useful in a search or filter operation, such as the day of the week and date of the drawing. Be sure to always enter numbers in order - that is, earlier drawings need to be entered first. - The individual numbers of the lotto number can be entered in any order, then followed by any powerball or extra numbers, then finally by day and date or any other useful information you'd like to add. Once you've entered a lotto number, press the GO button. The number you entered will "jump into" the window to the right. If you have several lotto numbers to add, you can continue entering them, pressing GO each time. If you press GO and get an error message, or the number doesn't jump to the right, try again, making sure that the number you enter matches the game you are trying to add it to. If you don't enter enough numbers, for instance, the program will ignore or reject your entry. Also, make double-sure that you are entering the main lotto numbers first, followed by any extra numbers like powerballs or bonus balls. The NO button will let you delete the last number you added, and fix it. If you've made a mistake, and don't want to add anything to your history file, press Cancel. It is worth noting that numbers may be entered manually from the Import screen as well, and you may prefer that screen for entering long lists of numbers. 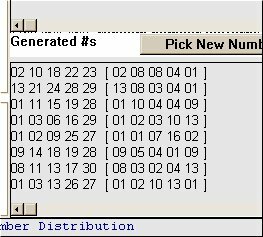 This window contains 100 numbers generated by Analysis Lotto according to the game and calculation system that you've specified. The number that appears in the Lotto Number window is based on this list. You can play the single number that appears in the Lotto Number window, or look through this list of 100 numbers for interesting numbers to play, or press the Choose button to have another optimal number from this list selected for you. Pressing this button replaces the numbers in the Generated Numbers list with 100 new numbers, and chooses a new number for you to play in the Lotto Number window. Each time a new drawing takes place, you should enter it into your history database (see Add Latest Number) then press Pick New Numbers to get a new series of 100 numbers, and a new choice in the Lotto Number window based on your game and the latest historical data. Tutorials are available on the Delta Lotto DVD now at a great price!